I just read this email from my cousin Helen. She had been showing Aunt Kath the post and the comments. “Just managed to prise Mum away from your blog. That was a real success although she couldn’t read the comments she could see the pictures and the bold headings and loved it. Thank-you, everyone. Warm fuzzy moments all round. In the last few weeks I have received an embarrassment of awards, and I have been very slow to do anything about them. So, in the spirit of turning over a new leaf, and also because I am chuffed to bits about getting it, I am going to pass this award on the same day I have received it. I only heard about a week or so ago, and thought it was a great idea. After all, where would we writers and photographers be without the people who read our posts? Readers bring so much to what they read. I really value the thoughtful, appreciative, humourous and encouraging comments I receive. 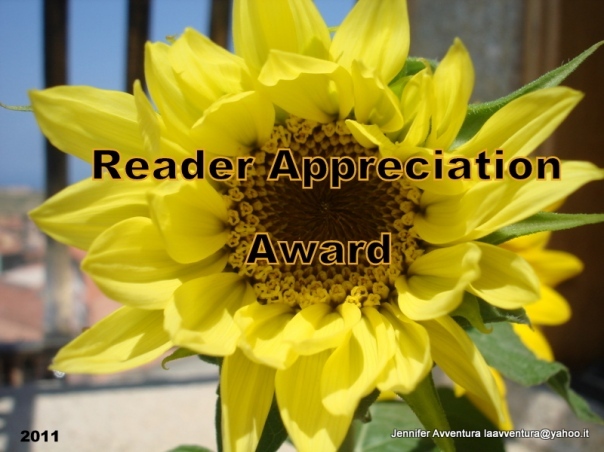 Thank you to http://50yearproject.wordpress.com/2011/12/15/the-reader-appreciation-award/ for giving this to me. This woman has a crazy project to read zillions of books, watch zillions of films and visit hundreds of countries. She’s doing pretty well too, and still sounds quite sane! I’m going to steal a line from what you wrote when you posted the nominations, because the criteria I’m applying too. Here are the blogs I would like to thank for not only commenting on my blog, but for being supportive, friendly, and fun to interact with. I wanted to reply to comments on my post of yesterday evening, but I can’t! Very odd. So thank-you to everyone who wrote a comment. It was enlightening, though I didn’t understand alanh’s ref to someone who was posting at 6.46 as well, and was the faux johnmitchell comment about my lost name? I was able to edit and put Duckham’s name back into the post. Now how did that vanish? I hadn’t realised he’d been deleted. But surely deletion is one thing. To remove his name totally, even from my post last night, seems like Stalinist airbrushing.